After reading Mike Callicrate’s article about you in the OCM newsletter, I feel compelled to respond to your recent blog about me and the good hardworking employees at GIPSA that I was honored to lead. Two old sayings come to mind when dealing with you. You obviously have some ability to write but mostly in the area of fiction disguised as the truth. Could it be for the almighty dollar or do you just have lying in your DNA? Perhaps we can approach your piece of yellow journalism in a true or false fashion just like they do on television fact check episodes. Dittmer: The only thing Congress instructed Butler to do is define “unfair” and “deceptive” and that he did not do. Butler: The Secretary of Agriculture has had the authority to write rules and regulations since the inception of the Packers and Stockyards Act (Act). However, in the Farm Bill, Congress actually directed GIPSA to write several regulations. One of which was about preferential treatment. This subject is addressed in section 202 (b) of the Act. We wrote the regulation to help clarify the broad language in this section of the Act. I have learned that clarification always helps reduce litigation. Since we were addressing this matter, the staff and I thought it made common sense (a concept foreign to some journalists and many members of Congress) to also help clarify the language in section 202 (a) that deals with any unfair, unjustly discriminatory, or deceptive practice and/or device. We did so by declaring that retaliation, denial of due process, bad faith and fraud were violations of section 202 of the Act. Of course you fail to mention that certain politicians on the appropriations committees (not the agriculture committees) in the House and Senate, who have prostituted themselves to NCBA and big agribusiness companies, have managed to derail the implementation of certain sections of the proposed rule by placing restrictions on the Secretary of Agriculture thereby blocking funding for finalizing these specific sections. Their actions validate the old southern saying, politicians are like bananas, they come in green, turn yellow and then get rotten. Dittmer: Butler just tried to eliminate or prohibit or strangle anything that wasn’t an auction between every segment of the industry. 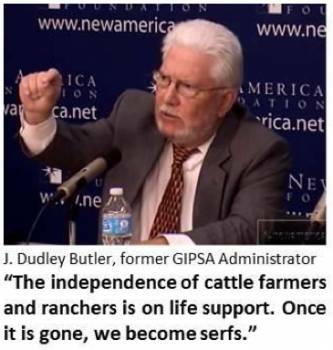 It still is mind boggling that after decades of the beef industry striving to identify quality, produce quality and deliver quality to consumers, Butler was attempting to strangle the incentive — premiums — for anyone in the chain to produce higher quality or even differentiate different products for different markets. Butler: Actually I am a big proponent of quality incentives and value added products. I sold my cattle to Laura’s Lean Beef for several years. I am also a big proponent of a competitive marketplace, and the only thing standing between cattlemen like myself and vertical integration is the existence and viability of auction markets across this country. Contrary to your message, the proposed rule did not eliminate any value added programs. What it did do was require the packers to retain financial records that they already prepare in the normal course of business to enable GIPSA to ensure that farmers and ranchers are treated fairly and that there are verifiable reasons for premiums and discounts. The rule would have protected all farmers and ranchers from discriminatory pricing as well as other deceptive practices. It did not affect legitimate value added premiums or legitimate discounts. For the marketplace to work there must be a level playing field. If certain members of Congress had allowed GIPSA to complete the rule, the 61,000 comments would have been taken into consideration and the final rule would have contained changes based on the concerns expressed in the comments. Dittmer: Butler and his friends continually lose sight of the real, limited purpose of government in the first place — to protect the citizen/consumer, to clear the path for the highest quality products at the lowest price. He characterized NCBA and state cattlemen’s groups as not being cattlemen’s groups but “industry organizations” because NCBA has a few packer representatives on a board exceeding 120 members. Butler: My friends and I definitely feel that the consumers are the boss. They are the ones that decide how to spend their money. NCBA has lost its way by placing big meat packers and retail interests over cattlemen’s interests. That is why I am no longer a member. Why does NCBA fight country of origin labeling? The consumers want it but the packers don’t. Why does NCBA fight the GIPSA rules that deal with unfair practices? Most farmers and ranchers want rules ensuring fair trade but the packers don’t. Dittmer: P & S under Butler was missing or ignoring one of the biggest financial busts by a livestock dealer in history — Eastern Livestock. Butler: In fact GIPSA was the first agency to address this matter. However, once it was determined that it was a criminal matter, GIPSA was instructed to stand down. Why do you fail to mention that neither the banks involved nor the bank examiners knew what was going on until checks starting bouncing. Why did you not mention that many involved in this check kiting scheme have gone to prison? Why did you not mention that there was a House of Representatives investigation that determined no wrong doing on the part of GIPSA? Steve, it seems you have once again proved that you are both a puppet of NCBA and the big packers, and when it comes to presenting the facts you don’t know whether you a scratching your watch or winding your derrière. However I have a solution to your problem. When it comes to the GIPSA rules I will publicly debate anyone, anywhere, anytime that you choose.